When Doctor Who returned to television in January 1970, it was with two new and exciting elements: Jon Pertwee in the title role and broadcast in colour for the first time. However, opportunities for the collector continued to be limited during Pertwee’s first year. The single item of exclusively Doctor Who merchandise released this year was the traditional Dr. Who Annual from World Distributors. Even this was produced in lower print volumes than previous years, making it the most difficult of the annuals to obtain. Doctor Who reappeared in TV Comic with issue 944, 17 January 1970, now featuring Jon Pertwee as the Doctor, appearing alongside the Brigadier, and would continue throughout 1970. The return of the Doctor Who strip had been announced in each of issues 937-941 during November and December 1969, and was previewed a week earlier in issue 943, 10 January 1970. Liz Shaw was introduced to the strip in issue 960, 9 May 1970. Doctor Who also featured in the TV Comic Holiday Special 1970 and the TV Comic Annual 1971 (published September 1970). A set of promotional photos (similar to the cast cards that were sent to fans, but in a larger size) were released to coincide with the start of Pertwee’s time in the role. The Space Museum has a copy of the Pertwee photo, but is seeking the corresponding photos of Nicholas Courtney as the Brigadier and Caroline John as Liz Shaw. Cast cards that could be obtained by fans were also released for Pertwee, Courtney, and John. Again, the Liz Shaw card is missing from The Space Museum’s collection. 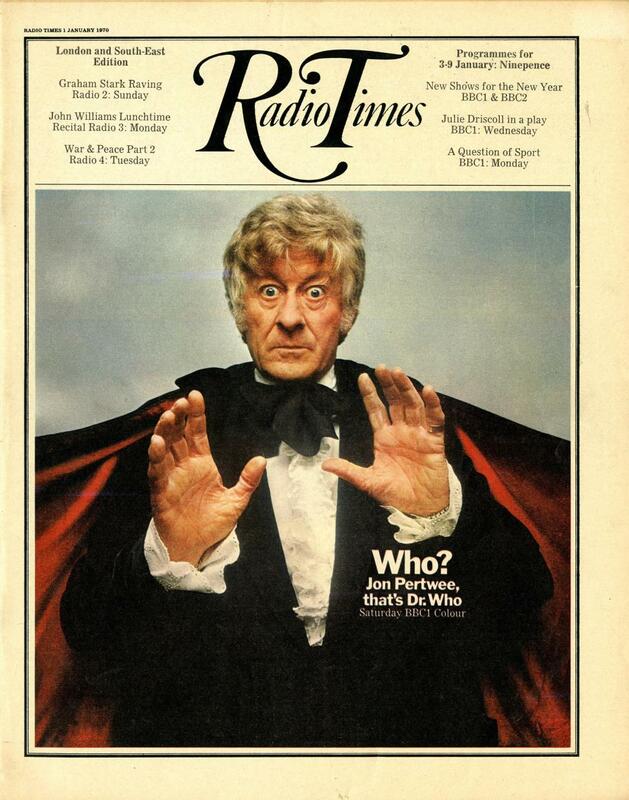 The Radio Times improved its coverage of Doctor Who this year, beginning with Jon Pertwee in an iconic pose on the cover of the issue dated 3-10 January 1970. Articles, photos, and illustrations appeared throughout the programme’s 1970 series. A complete list of Doctor Who in the Radio Times can be found HERE. There also continued to be reasonable media coverage of Doctor Who in other magazines and newspapers. A selection of these articles is shown in the gallery.